Would you pay an extra $50 for an older book? We publish Office 365 for IT Pros in EPUB, PDF, and Kindle format. The EPUB/PDF version is available from Gumroad.com while Amazon is the only distributor for Kindle. 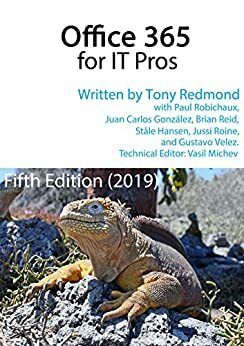 We prefer if people buy the EPUB/PDF version because we can communicate with you and advise when updates are available, but many people really like the Kindle version (in passing, I note some reports of good results in converting the EPUB version to Kindle format using the freeware Caliber e-Publishing software). We do update the Kindle book when we update the EPUB/PDF version. We then ask Amazon to tell buyers know that updated files are available. However, Amazon is very reluctant to ask Kindle buyers to download new files. Their model is built around novels and other books that don’t change often, so when you load an updated Kindle book, you lose bookmarks. We can’t do much about this because that’s how Kindle works. In any case, sometimes we persuade Amazon to tell people that updates exist, and sometimes we don’t. If you look at Amazon today, you’ll see the 2019 edition, the older 4th edition, and the companion volume (bundled with the main book for EPUB/PDF purchases). You’ll also notice that the older book is priced $50 higher than the newer. We did this to dissuade people from buying the old book while keeping it online to allow those who bought it in the past to download updates. We even tell people in the blurb for the old book that they should buy the new. The really interesting thing is that we continue to see people buying the old book. And the only reason we can see why this happens is that the old book has 29 customer reviews while the current book has none! We have no idea who these buyers are because Amazon controls the customer relationship and never tells authors who buys books, so we can’t contact the buyers to arrange a refund and get them the latest book. The power of reviews obviously drives buying behavior and overcomes the warning in the book blurb and the much higher price. It’s a really interesting example of how people react to positive confirmation of value from peers in the Amazon reviews. We’re going to solve the problem by taking the older book offline in a month or so. If you have the older book on Kindle, please refresh your library to make sure that you have the latest content (here’s a good article to explain how to fetch updates). And if you have the 2019 version on Kindle, perhaps you could write a review to help guide potential buyers away from buying an old version that is now very outdated.